Good Beer Seal bar owners/reps at the annual luncheon included Dan McLaughlin (The Pony Bars), Gary Gillis (Standings/Burp Castle), Dave Brodrick (Blind Tiger), Ben Wiley (Bar Great Harry/Mission Dolores), James Langstine (Bronx Ale House), Dave “Rev” Ciancio (Idle Hands), Carolyn Pincus (Stag’s Head), Ryan Barker (Adobe Blues), Sam Barbieri (Waterfront Ale House), Juan Cruz (Sunswick 35-35), Jimmy Carbone (Jimmy’s No. 43), Chris Cuzme (508 Gastrobrewery/NYC Homebrewers Guild), and Bree O’Connor (Beer Sessions Radio™). As a lead up to NYC Beer Week (2/24-3/3), Jimmy’s No. 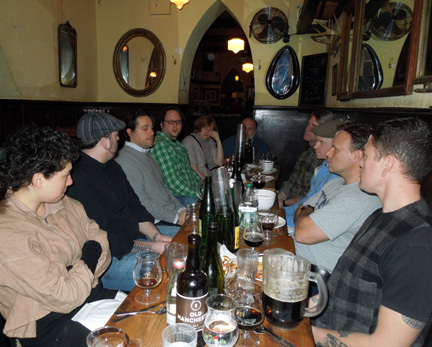 43 played host to the annual Good Beer Seal bar owners’ luncheon on February 7th. Happily, all five boroughs were represented by 13 GBS bars, the NYC Homebrewers Guild, and Beer Sessions Radio™. Bar representatives discussed the state of being a craft beer bar owner and Good Beer Seal community member. Among the more interesting offerings on the lunch menu was a Samichlaus 1997, provided by Sam Barbieri (Waterfront Ale House). This was the last vintage brewed and bottled by Hürlimann Brewery in Switzerland. Waterfront Ale House has been open since 1989 and has an amazing cellar of vintage beers. For NYC Beer Week, they will be featuring one beer from each of the NY Brewers Guild breweries with food pairings. February 27th – NYC Brewer’s Choice at City Winery – THE MARQUEE EVENT OF NYC BEER WEEK! Check back often for updates to events and happenings at all 41 Good Beer Seal bars, and don’t forget to tune in to Beer Sessions Radio™ for all your craft beer news during and beyond NYC Beer Week. Tags: Beer Sessions Radio, Good Beer Seal, NYC Beer Week, postaday. Bookmark the permalink. Previous post ← Countdown to NYC Beer Week: Nano-Beer Vegetarian Nonsense™ Brewer Mike Philbrick of Port Jeff Brewing Co.